Loren Thompson, the Lexington Institute founder, and policy wonk the Non-State Actors and Opposing Ax-Grinder types love to hate has a 'pretty good' column up at Forbes titled "Massive Cost Estimate For Fighter Program Is Misleading" where he bemoans the curious external cost estimate 'inflation' that is all the rage and afflicting the F-35 program these days. I'm not a huge fan of Thompson (or of his lead Defense Policy Wonk Dr. Goure) but then again I'm not a fan of pure defence 'policy' experts in general. The mere need to attach 'policy' to the moniker usually screams a certain 'political' and not 'technical' expertise. The 'big picture' view of 'policy' types often leads them to not pay close enough attention to the hard details --and then they falter in reinforcing their points by using flawed anecdotes or examples.This penchant, I believe, detracts from their ability to get their message across and can harm their credibility in the eyes of those they seek to influence the most: marginally involved and undecided politicos (directly)... and (indirectly) a large part of the interested public. But after the early missteps in the piece (which I will discuss shortly), Thompson lays out a very good review of what is actually going on with all the 'funny' numbers being thrown around concerning the F-35 program. 1. 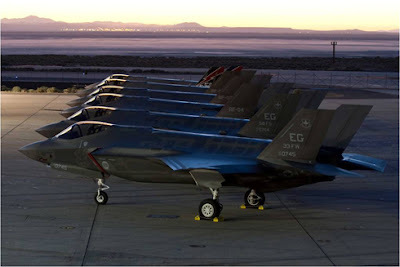 "The F-35 Joint Strike Fighter is the most expensive weapons program the U.S. Department of Defense is currently funding. The reason it’s [the program] so costly is that the Clinton Administration decided in 1993 to replace a slew of cold-war combat aircraft operated by three different military services with a single family of planes. a. The simultaneous procurement of the AF’s High-Low mix (F-15 & F-16) in the 70s-80s. It should surprise no one that concurrent acquisition increases probability of concurrent obsolescence. The F-16s are in a little better shape wear-and-tear-wise than the F-15, but the Stealth Revolution and advances in near-peer fighter and air defense technology is bringing obsolescence to both fighters at about the same rate. b. The failure of the Navy to execute the A-12 program. A large gaping hole was created in Naval Strike when that program failed and after the A-6s were retired. 2. Cost is crucial for two reasons. First, if the price of each plane rises too far, potential users will start dropping out of the program. Fewer users means lower production rates, so economies of scale are lost — leading to further price increases. This dynamic is referred to in the aerospace industry as the budgetary “death spiral,” a process that did in the Air Force’s last new bomber and fighter before production numbers got anywhere near what the service needed. "However, what got lost in the exchange was the distinction between estimates and actual costs. The more you examine the program’s track record to date and the methods utilized to calculate future costs, the less clear the program’s real price-tag becomes. In terms of the track record so far, the contractor has repeatedly delivered early production planes for less than the Pentagon estimated they would cost, and its internal projection is that it will be able to market the most common version of the plane at about the same price that its F-16 fighter currently sells for overseas — about $65 million each." [I like the whole section on this topic] A further degree of confusion is fostered by failing to distinguish between actual cost growth and changes in the counting rules used by government estimators. 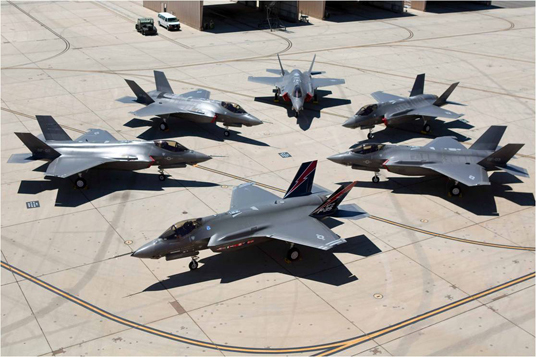 Three-quarters of the increases in F-35 support costs reported by the Pentagon have resulted from changes in the scope of work being analyzed or changes in the methodology for how costs should be calculated, rather than rising costs in the program. With regard to changing scope, the government has increased the number of years estimates cover since its initial cost projections from 30 to 50; it has increased the number of bases where F-35s will be stationed from 33 to 49; and it has doubled the amount of support equipment it plans to use in sustaining the aircraft. With regard to changing methodology, the government revised its formula for projecting support-cost growth (adding $50 billion to estimates); switched from industry to in-house metrics (adding $33 billion to estimates); and included capability upgrades previously excluded from support-cost models (adding $28 billion to estimates). All told, government adjustments unrelated to contractor performance have more than doubled F-35 support-cost estimates since the program began. ... 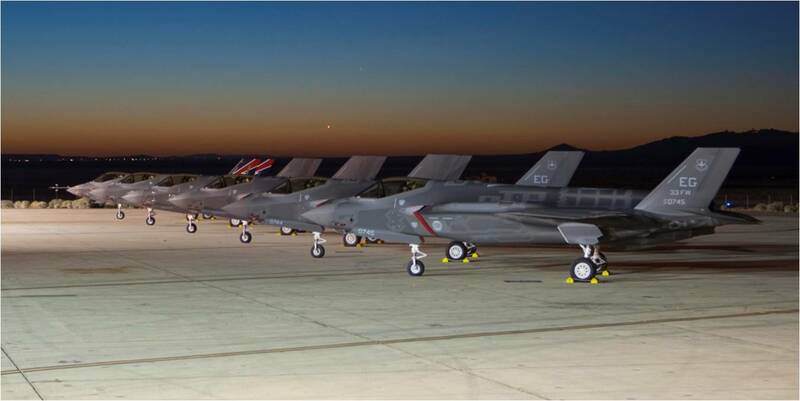 They also failed to note that the F-35 management system was designed to track all costs associated with operations and support, whereas legacy aircraft lacked comprehensive accounting systems. This point has been noted repeatedly by the Government Accountability Office, a watchdog agency, and explains why items like aircraft modifications, pilot training and information systems are captured in the F-35 cost estimates but not in the support-cost estimates for previous planes. When comparisons are adjusted to remove [just] this disparity, the cost per flight hour of the F-35 is only about ten percent higher than that of legacy planes for a fighter that is far more survivable and effective. Added 29Jun11: Solomon over at SNAFU has a good post up on F-35 shipboard integration where they talk about the F-35 program paying for the cost. Some integration and alot of other costs for legacy programs have not always been booked against the airplane program proper. the F-35 has the most inclusive cost numbers I've ever seen. This [is the] kind of cost accounting disparity between F-35 and legacy programs that Loren Thompson refers to above. 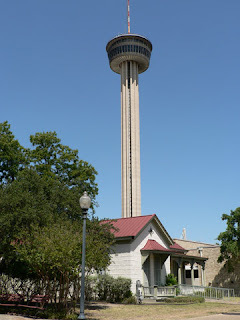 Wrapping up a long weekend in San Antonio, Texas on an Anniversary getaway.I lived in San Antonio twice while growing up, including the magical 1968 when the World's Fair was here. My Mother was born and grew up here. I've been back several times over the years and this time I have to say it was the most disappointing trip ever. It wasn't the heat (105 degrees today! ), it wasn't the so-called luxury hotel on the Riverwalk (Housekeeping WAS excellent btw).--- It was the 'city': San Antonio is rotting from the inside out. Between the panhandlers at every turn (Downtown AND out at the Loop 410) and crazies (Downtown) running around, the City is a shadow of what it was. I was particularly struck by the disrepair of city parks and properties, including a late 1800's stone house built by my Great-Great-Grandfather and several other buildings on the old Hemisfair grounds. My Grandmother sold the house to the city under an Eminent Domain deal for use in the World's Fair. The bars and restaurants along the Riverwalk and in the Northwest area were great, but speaking as someone who has bought nights in hotel rooms in Washington DC, San Diego, Atlanta, Tampa, and Los Angeles in the past two years, San Antonio is waaaay too proud of their hotels. Mine didn't even have non-valet parking, and the city lot across the street gouged me for a flat rate, in advance, on my last night that will require me to leave by 0800hrs tomorrow to keep from paying even more. Add to that finding just about the highest number of A**holes per square mile that I've encountered in the State of Texas, and I am left with very little reason to come back. I used to count San Antonio among my few real 'hometowns'. No more. We enjoyed the attractions we took in and our weekend in spite of instead of because of the 'city'. Thanks for nothing San Antonio, next time I'll drop my many hundreds of $ in Fredericksburg or someplace else where it is appreciated. Update 18 June: Back home and able to post a couple of photos. 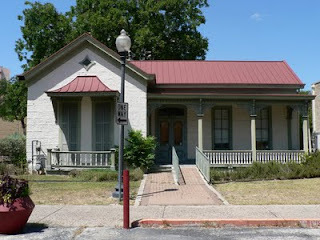 Here's Great-Great-Grandfather John Kusch's house on the old Hemisfair grounds that I refer to above. The 'city' is not a very good caretaker IMHO, so no telling when and if they decide to just tear it down after letting it go to pot, so I decided to at least preseve the memory. Ah...A 'Boeing Tall Tale' to scare the children. Someone should tell them that the UAV world is still a fairly small and close-knit one...and made up of people with very good memories. David Axe has a piece up at Wired’s Danger Room that self- identifies as an uncritical ‘Boeing POV’. While Northrop Grumman evidently declined to comment on Boeing’s collective memory, that hardly excuses the slobbering deferral to Boeing’s ‘claims’ and the gross lack of investigative skill or skepticism applied in the article. That it seems like Axe didn’t bother with a critical eye at all in this ‘effort’ is shown by the assertion that the Government gave Northrop Grumman money to develop the X-47A. Wrong. US Government funding came after the development of the Pegasus. The ‘Pegasus’ was a “company-funded” effort that Corporate Vice President Scott Seymour sponsored and nurtured through a rapid development process to keep Northrop Grumman in the UCAS running. This fact was in all the news at the time. The ‘Pegasus’ existed before DARPA got involved and gave the UAV the ‘X-Plane’ designation. Since Scott Seymour no longer works for Northrop Grumman, perhaps he might be willing to talk to David Axe about it some and give another viewpoint that isn't 'All Boeing'? I know software developers and integrators that produced the X-47A, so far the only response I’ve received from any of them when I refererred them to this article is that the piece made their stomach turn….and to tell Axe the X-47(A or B) is not ‘remote controlled’: It is AUTONOMOUS -- with provisions for human intervention by exception rather than as a rule. If Axe ever viewed the X-47A first flight video, he might have observed that no one was 'controlling' the Pegasus: everyone was monitoring the flight. The only commands given by the ‘controller’ (‘Old Heads’ in the Test Pilot community should immediately recognize him in the control room BTW) was to hit the ‘GO’ button to get it moving off the parking spot, some EOR power checks by the engine contractor, the ‘release brakes’ command for takeoff and a precautionary speed change. For a 'First Flight'? Incredible. The whole point of the exercise was to demonstrate autonomous flight with a precision carrier-type approach and landing, which the demonstration did admirably (See SRGPS link below) . Having got the who-funded-what wrong on the X-47A, Axe’s Boeing fairy-tale tellers didn't get any better. He should try to be a little less gullible next time. He had me falling out of my chair laughing with the Boeing claim that since their X-45 was 'thinner' it would be stealthier. He should have asked them: how many LO weapon systems they've fielded to-date? There are two houses that really ‘get’ LO: ‘Northrop’ and ‘LockMart’. Boeing is playing catch-up, and OBTW they benefitted greatly in the LO department when they bought McDonnell Douglas who benefitted from exposure to Northrop’s LO expertise on the F-22 and JSF programs. If the Borg (my Lockheed Martin colleagues’ favorite name for Boeing) hadn't bought Rockwell and McDonnell Douglas, they would be even farther behind than they are. My favorite line from the article though has to be: "How could Northrop, with what they strongly believed was inferior software, possibly pull off a robotic carrier landing cheaper than Boeing?" WTFO? Sounds as if the Borg ‘believe’ it, then it just HAS to be true, doesn’t it? Not on your life. Boeing's explanation on the cost differential doesn't hold water for a variety of reasons I won’t (can’t) go into either. Suffice to say the X-47A first flight was also the first flight for the Navy’s Shipboard Relative GPS (SRGPS) system aka ‘Navy JPALS’. Read the entire article at the SRGPS link – there’s lots of info on what Northrop Grumman actually accomplished (on their dime) with that little self-funded ‘Phase 1 ’ hop. Raytheon BTW, has since selected Northrop Grumman’s IMU as the heart of their JPAL System. So perhaps Northrop isn’t as 'hapless' when it comes to navigating UAVs around the patch as big bad Boeing would like the unwashed masses to believe? Maybe Northrop Grumman has resources to draw from beyond their airplane-building sector that Boeing chooses to selectively ignore? Axe was fed a treble hook on a 100lb-test line this time. If he is not careful, he is well-positioned for continued use as a Boeing pawn in Boeing's ever-more desperate attempts to be relevant on the combat aircraft scene. I fear Boeing will eventually start winning 'something' just to keep them in the game. Expect to hear even more woe-is-me BS from Boeing as production contracts near for a Naval UCAS. But I had to listen to Boeing tell the world it was they who really did the software and integrated the B-2, and now LM gets to hear the same crap over the F-22. Boeing shouldn’t be allowed to rewrite history on UCAS programs as well. 06/15/11 Update:I'm starting to get e-mail correspondence on this post pointing out other problems with 'the story' as Boeing narrated and Danger Room presented. 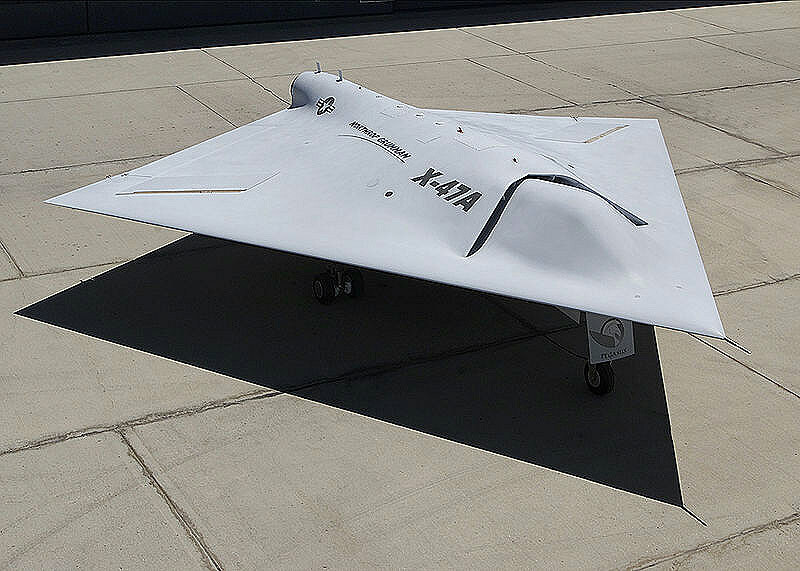 One commenter noted that Axe got the first flight date of the X-47A nearly a year later than it actually occurred. The X-47A first flew on 23 Feb 2003 and NOT "January 2004" as claimed in the Danger Room article. One way this milestone might have been screwed up could be that the reference of the February 2003 flight was pulled from a reference to it posted/published in January 2004. Every time I fly, listening to the flight attendant's sincere directions containing the simplistic assertion that personal electronic devices (PEDs) may interfere with aircraft operations and directives that I must turn off my electronic devices ALMOST makes me forget I had just played a bit role in the latest episode of Security Theater. There is an ABC News piece with the headline "Is It Really Safe to Use a Cellphone on a Plane?" that attempts to build a mountain, not out of a molehill, but from a couple of grains of sand. I have DECADES of avionics systems laboratory and flight test experience, including conceiving, developing, and executing System and Subsystem EMI, ALT, HALT, Functional and Failure Mode Effects Test procedures. IMHO, this issue is about lawyers, liability law and the inherent imperfection and fallibility of ANY man-made device, and the certainty of failure given enough time. From this perspective, I have multiple beefs with both the article and many of the comments (44 of them at the time I read the article). 2. Events presented may or may not have had something to do with operation of the personal electronics devices, but even if they did, they still not point towards root cause. The problem could be with the electronic devices OR aircraft systems, as the possible failure modes for either, while not infinite ARE inestimable. 3. Airframe manufacturers and airlines have a vested interest in pointing at the PEDs as the ‘problem’. It prevents them from having to deal with additional design requirements, testing and the associated costs or having to improve designs in existence for operating in the modern environment and servicing the 21st century public. 4. Funny that the article suggests that ‘older’ planes may be more of a problem. The author should bum a ride in the back of GE’s engine test bed. It is one of the oldest 747s still flying, and during test missions you will find the back end filled to the max with rows and rows of equipment racks with panels off running at full tilt, ad hoc instrumentation data lines, laptops up and running, and guys on cell phones and radios talking to the data download facility, and the last I heard (from THE guy who would know) they’ve never had a problem. That’s alright 'spsooz'. While I can’t speak for ‘most of us’ on the other side, I stopped being impressed with cabin crew performance right after they stopped turning into Kiwis and started turning into crones (and I’m not talking about ‘age’ here). It’s HOW one does their job that makes the difference, and today the traveling public gets to see a broad range of what gets defined as ‘professionalism’. "If an airplane is properly hardened, in terms of the sheathing of the electronics, there's no way interference can occur." There are still doubters, including ABC News's own aviation expert, John Nance. "There is a lot of anecdotal evidence out there, but it's not evidence at all," said Nance, a former Air Force and commercial pilot. "It's pilots, like myself, who thought they saw something but they couldn't pin it to anything in particular. And those stories are not rampant enough, considering 32,000 flights a day over the U.S., to be convincing." Nance thinks there are alternate explanations for the events. "If an airplane is properly hardened, in terms of the sheathing of the electronics, there's no way interference can occur." After this passage comes a "yes, but" follow-on from Boeing's experts that provides another but not necessarily contradictory POV. Nance's last statement is irrefutable. First Rule of Problem Solving: Is it My Problem? It makes perfect sense to require PEDs to be turned off during critical flight phases, but stop blaming the PEDs in advance. This tactic allows the airline and airframe manufacturers to continue to assert a defacto loophole from being held liable and allows them to continue to not deal with a possible problem that should be their responsibility. Any ‘incompatibility’ can be due just as easily to insufficient or unfortunate aircraft systems design, installation or maintenance as anything else. IMHO, the problem should be considered to be on the ‘airplane side’ since the purpose of the plane and airline is to serve the 21st Century travelling public vs. the other way around. "I know little of military aviation, and even less of experimental flying, which is perhaps the most inspiring and yet fateful of all". There is just so much wrong with this hit piece posing as an 'article' I want to frickin' scream! A Marine spokesman, Capt. Brian Block, said the finding of "human factors" as the cause of the accident should not be equated with pilot error or blaming the pilots. "Whenever a mishap like this occurs, we owe it to our Marines to take an honest, dispassionate look at all possible contributing factors to ensure it does not happen again," Block said. "The investigations into this mishap revealed that human factors contributed to, but were by no means solely responsible for, this mishap. "These findings in no way impugn nor denigrate Maj. Gruber and Lt. Col. Brow's reputations as Marine officers, Marine aviators, and MV-22 pioneers. Maj. Gruber and Lt. Col. Brow were selected as pilots for what, at the time, was a brand new airframe precisely because of their courage, skill, and impeccable records." Navy spokeswoman Lt. Cmdr. Tamara Lawrence said Mabus reviewed the crash investigation reports and "determined their conclusions still stand: that it was a result of a chain of events which, taken together, resulted in the loss of very talented and brave Marines." A spokesman for Fort Worth-based Bell said "it would be inappropriate to comment on an internal Marine Corps matter." 1. What made him think asking the aircraft manufacturer for a comment on a human factors finding in a USMC accident investigations wasn't inflammatory and inappropriate in the first place? Or did he ask knowing it was? 2. If he recognizes the contributing role he and other jack-jawed 'journalists' played in the pressure put on the program to perform since, as he wrote in the article, the V-22 was "In development since 1981, at a cost approaching $15 billion, the Osprey was a troubled program. It had been the target of critics inside and outside the Pentagon..."? From his position several miles away, Schafer said he knew the two aircraft were too high as they began to descend. For safety reasons, any pilot or co-pilot on that mission could have called a halt to the plan. "I could have stopped that crash. I could have called a wave-off. I was the most experienced [pilot]. 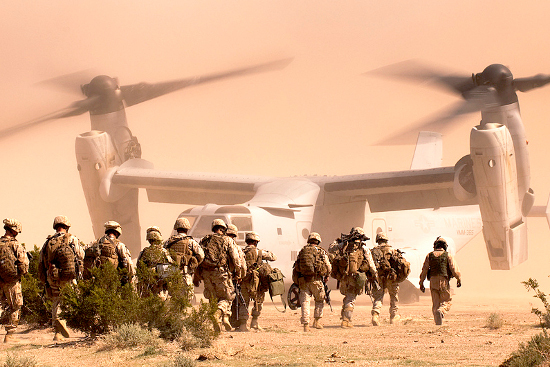 I had the most hours in the V-22 of the test team," Schafer said. "I've been in their position and been too high in a V-22, and that airplane isn't friendly when you're trying to descend fast." Most of all, the article gives me (again) the urge to kick Bob Cox's macabre little voyeuristic a**. “Speed Kills”… or "Low Observability Changes the Survivability Equation: Speed No Longer Reigns Supreme". ….The one thing stealth did not do is make speed less valuable in air warfare. It is unfortunate that we've forgotten the lesson "speed is life" in the interest of making aircraft stealthy. The SR-71 combined a limited degree of signature reduction with high speed and would still be difficult if not impossible for most countries in the world -- including the Russians and Chinese -- to shoot down. Even missiles that fly faster than the SR-71 cannot sustain those speeds for a long enough time to hit that airplane regardless of whether they carry their oxidizer on board or get it from the air around them…. "Speed is Life” is an Enduring Myth. NOTE: This is not to pick on the commenter who made the above assertions – I’ve heard similar from professionals who really should have known better. Myths die hard. “Speed is Life” is an example of an air combat concept that has outlived its status as a ‘maxim’ and should be modified to read accurately today as: “Speed is Life… to a limited extent…maybe…sometimes”. More often than not, against an integrated air defense system in today’s battlespace, a truer statement would be: “Go Faster – Die Sooner”. To support my assertion that in effect ‘Speed Kills’ the following are releasable excerpts from a study (disclosure: mine, written in 2000 and updated in 2009) that included observations concerning the Aeronautical Systems 1999 ‘study’ “System and Operational Implications for Choosing Best Speed for Global Missions” (aka ‘Speed Study’ or ‘ASC Study’) and the treatment of ‘speed’ vs. ‘survivability’ in other publications as well. ….. The ‘weaponization’ section of the ASC Study report reviewed the study’s exploration of the interrelationship between aircraft speed, altitude, and the ability of a very fast platform to attack using large standoff launch distances from a target. The report includes the observation that the survivability of the weapons, like the candidate platforms, would be based upon a best-value combination of factors including speed, altitude, tell-tale signatures maneuverability, and countermeasures. The definition of best value was not included in the report. The report indicates that the study further explored the ramifications of such a launch technique on the standoff weapons’ conceptual designs, noting that a higher kinetic energy delivery could reduce the fuel fraction of powered weapons and allow the weapon to have a larger warhead. The ASC Study report reiterated that to ensure adequate survivability, all platform concepts studied would rely on the employment of standoff weapons to keep away from dense threat areas during the initial phases of an air campaign until other assets could be brought into theater for support, and presented a chart (p. 58) showing the relative glide weapon ranges when launched from aircraft flying at various speeds and altitudes. It is worth noting that while large launch distances from the target can be achieved, for the various concepts, it is seen that all launch platform concepts close the gap between the threat area and their position significantly after launch. It should be noted that it also appears from the study data that the faster the platform speed, the greater the post-launch closure to the target and threat area. A theoretical example of this dynamic is illustrated in Figure 9. Figure 9. 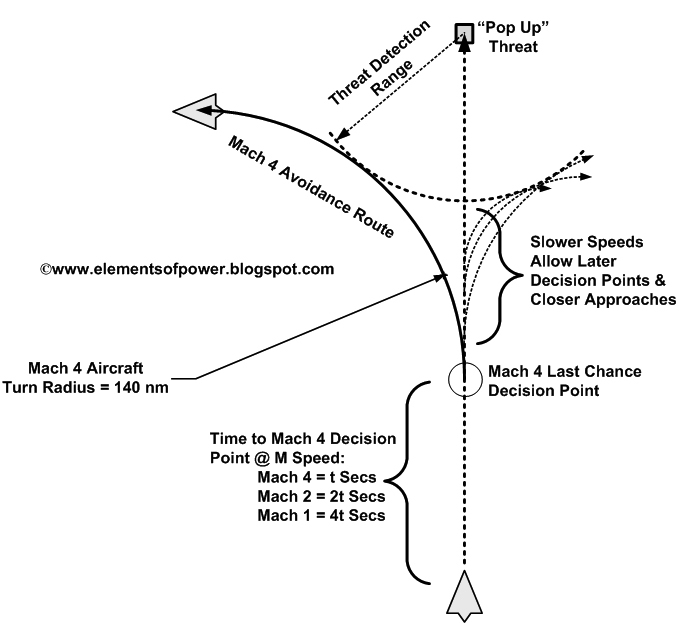 Hypothetical Mach 4 aircraft post-launch closure to target and associated potential threat. 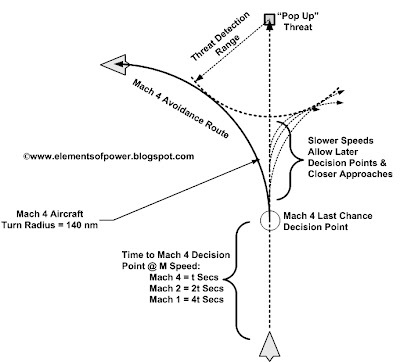 Figure 9 illustrates estimates and profiles provided in the report for a Mach 4 launch of a glide weapon. This specific example presents the geometry of launching a weapon from approximately 180 nm away from a target to deliver the weapon with a .85 Mach impact speed on the target. 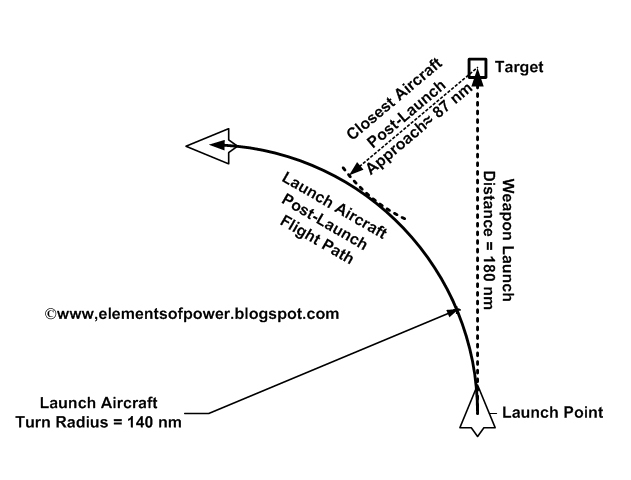 Using the Gravity-load (G-load) factor provided by the study report for a practical operational turn, the launch aircraft would approach within approximately 87 nautical miles of the target after the launch in executing a turn away from the target. The launch aircraft closes to less than half the original launch distance after weapon separation. A thorough examination of the synergy that comes from combining standoff weapons and stealth is available (Paterson 1999), illustrating how the combination of stealth and standoff weapons delivered using conventional launch techniques becomes a significant contributor to survivability. However, it cannot be determined from the ASC report if the net impact of the post-launch closure at stand-off ranges using higher kinetic launch events was considered or factored into the ASC study’s kinetic delivery survivability assertions. If the candidate platforms were maneuvered in a manner that exploited the modicum of reduced signature reduction they were assumed to employ, then performing turns at even smaller bank angles would generate even larger turn radii, and the post-launch flight path of the aircraft would bring it even closer to the target and perceived threat, further minimizing the advantage of kinetic standoff attack…. While the relationship of speed and observability is elaborated upon and clarified within the 2006 Committee’s report, the 2006 Committee statement as it stands is incorrect and misleading. The quote is only accurate if the quality of the exposure time is equivalent. As noted by Grant (2001), the F-117s in Operation Allied Force had difficulty in maneuvering within the confined airspace over Serbia and Kosovo to attack targets and managing their signature profiles. When discussing transiting high threat environments at the greatest speeds possible, this must include provisions for management of the penetrating aircraft’s signature in doing so. 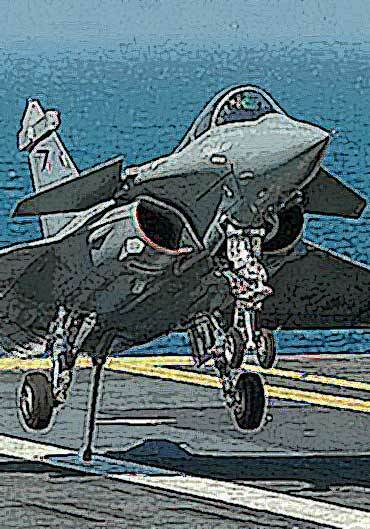 The faster the aircraft is moving through the threat environment, the more difficult it is to manage its signature. The probability of the faster systems being able to equally manage their flight profiles and in turn equally managing their signatures as well as slower systems in a high threat environment can be shown to be comparatively low. This is easily demonstrated using a variation of Figure 9’s Mach 4 scenario that was presented earlier. In Figure 19 below, time has been substituted for distances, and the target is now a threat. Figure 19. High speed aircraft have less time to avoid sudden appearance of new RF threats than slower aircraft. The implication here is that in negotiating a dense threat environment a high speed transit can reduce the time within a threat engagement zone, but increases the probability of entering an engagement zone in the first place. The reduced reaction time and increased turn radius of the high speed aircraft has negative ramifications in planning and negotiating a mission route through a dense threat environment. Thus any discussion of speed as a benefit to survivability must include the quality of the relative low observability and difficulties in executing a transit of a dense threat area at higher speeds. Post Script (a gentle reminder): The very definition of ‘Stealth’ is Very Low Observables (VLO) AND Tactics. “VLO” is highly ‘reduced’ radar (RCS), IR (Radiant Intensity), visual (Contrast, Area), acoustic (Sound Pressure) and EME (Electromagnetic Emissions) signatures. VLO designs are tailored to balance those signatures based upon mission and threats. ‘Tactics’ are maneuvering, mission planning/routing, selected sensor operational techniques, and weapons application techniques. Tactics are applied to maximize the advantages of the tailored VLO design. If anyone makes any claims about ‘Stealth’ outside of, or ignoring its definition in toto, they haven’t got a clue. Grant, R. (2001). The B-2 goes to war. Arlington, VA: IRIS Independent Research Institute. Committee on Future Air Force Needs for Survivability, National Research Council. (2006). Future Air Force needs for survivability. Washington, DC: National Academies Press. Paterson, J. (1997).Measuring low observable technology's effects on combat aircraft survivability. SAE. Paterson, J. (1999). Survivability benefits from the use of standoff weapons by stealth aircraft, AIAA. Q: What happens when you're ahead of schedule during flight test and there's a long holiday weekend? 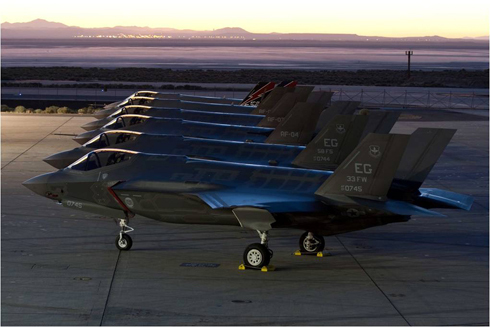 A: See this set of pics sent by a friend from Eddy (Edwards AFB) this week. I guess they weren't 'super' enough? Oh Well. Update: If you want to view another, more 'typical' POV that (surprise!) uses the first 4-5 paragraphs to inject the F-35 (negatively) into the story you could also go here. 1. India's requirements were dominated by ease of 'handling' (consequence of their Mig-23 experience?) with greatest maneuverability. Their Air Force is dominated by Fighter Meat Servos and they really wanted a 'yank and bank' plane.The F-16IN with the conformal tanks was at the bottom of the list in 'turning' and the F-18E/F is a 7.5 G airplane. 2. India's near-mechanical adherence to the selection criteria with little room for interpretation or recognizing and allowing for statistically 'bad data'. 3. The F-16 an F-18 were too 'long-in-the-tooth' to meet India's needs for an effective operational life of 30 years on the one hand, and some technology (F-18 engines) were too immature on the other. The F-35 and F-22 weren't on the table. 4. India was seeking greater growth potential in their new platforms AND wanted the technology transfer to come with that growth. Neither 'winner' of this round has an AESA radar, and India is betting on the 'come' that one will be available when production begins. Lots more info/details on the competition and logic applied therein at the link. Read it all. Since the KC-45 clusterfark I've learned to always suspect Boeing of ulterior motives and deployment of Marketeer Maneuvering Par Excellence whenever they produce an announcement out of the blue - especially if they're claiming some 'slight'. That is why when this popped up the other day, I began waiting for the other shoe to drop. It could be coincidence -- and if it were anyone but the 'Borg' I would insist it HAD to be just a coincidence -- but how odd is it that Boeing would pick a public bone with LockMart over F-35 vs F-18 cost claims, just days before another news item is released mentioning that up to 500 'Super Hornets' may eventually be replaced by F-35s as a possible option of future Naval Aviation recapitalization? Boeing plays the 'long' game. Do they play it this 'long'?